The United States has distanced itself from claims by MDC Alliance acting chairperson Advocate Nelson Chamisa at the weekend that President Donald Trump promised the opposition party a $15 billion kitty should they win the forthcoming elections. In his address at an MDC Alliance rally in Mutare at the weekend and in a bid to woo supporters, Adv Chamisa said President Trump pledged to bail out the MDC Alliance government with $15 billion for reconstruction and economic recovery programmes. In December last year, Adv Chamisa together with People’s Democratic Party leader Mr Tendai Biti travelled to Washington where they met several officials in the US administration. They suggested to senior Washington officials that it was not yet time to repeal the current ruinous and illegal sanctions against Zimbabwe. “When we met with President Trump in America alongside Biti, he asked us how much we needed to move the country forward and we told him that we needed $15 billion,” said Adv Chamisa, who is also MDC-T co-vice president. He said Mr Trump assured them that the funds would be disbursed immediately after winning elections since his government had faith in the MDC Alliance. But United States embassy spokesperson Mr David Macguire shot down the claims by Adv Chamisa, saying it was not Washington’s business to give money to political parties. “We do not support individuals or political parties,” he said. “We do not take a position on who is going to be a political leader of a country. The outcome of an election is up to the people of that country to decide. Information, Media and Broadcasting Services Acting Minister Simon Khaya Moyo said Government and the ruling Zanu-PF would not lose sleep over utterances by MDC-T.
“We are an independent country and we are not an extension of America. We are busy preparing for our elections and we will not lose sleep over those statements by the MDC-T,” said Minister Khaya Moyo, who is also Zanu-PF secretary for Information and Publicity. 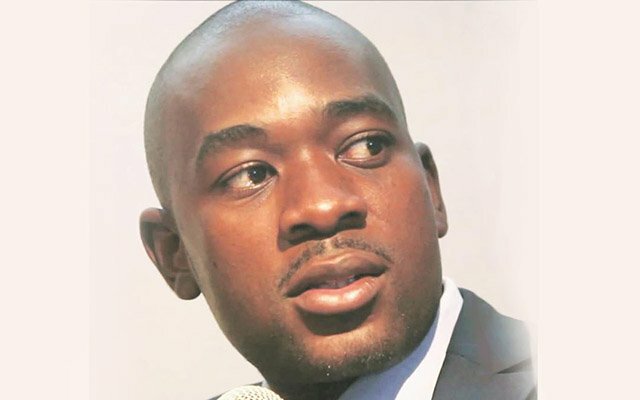 Political analysts said the statement by Adv Chamisa unwittingly exposed their mission to Washington, which was meant to perpetuate the illegal sanctions regime. The $15 billion claim, they said, was mere political gimmick, as Mr Trump would not release that kind of money to Africa given his perceived views of the continent. Professor Isheunesu Mpepereki said Adv Chamisa indicated that the MDC-T was determined to use sanctions as the stepping stone to State House. “They want people to suffer so that when that happens they would switch allegiance to the MDC-T,” he said. “They have continued to extract support through the suffering of people and that is ridiculous. Prof Mpepereki said the assertions were a carefully calculated political gimmick given that MDC-T leader Mr Morgan Tsvangirai once promised a $100 billion economy once elected into office while addressing party supporters in Gweru last year. Zimbabwe National War Veterans Association secretary-general Cde Victor Matemadanda said Zimbabwe’s sovereignty could not be traded for ill-gotten wealth. “What is it that Chamisa offered to Trump for him to pledge $15 billion?” he said. “We do not want to buy off our sovereignty. What we know and what we have all seen on television was that Chamisa and Biti went to America to call for sanctions and that is what he is now admitting. Mashonaland East traditional leader Chief Musarurwa said what Adv Chamisa said exposed the reasons for their mission to America. “If they are to get that money, it has to come with some conditions,” he said. “The conditions would obviously be to reverse the land reform programme and bring back whites who used to colonise us.